I kinda rip through my tangles in my hair (I have fine hair so it tangles a lot) when I should be gentle with it, and I get a lot of split ends. I don't always remove my makeup before going to bed. I don't moisturize as often as I should, and sometimes (a lot!) I take the shortcut and slather body lotion on my hands and wipe the excess on my neck and face instead of using products specifically for the delicate skin. I rarely wear sunscreen (but I also rarely go in the sunlight, lol). I pick mascara off of my lashes and oftentimes take my lashes out along with the clumps. 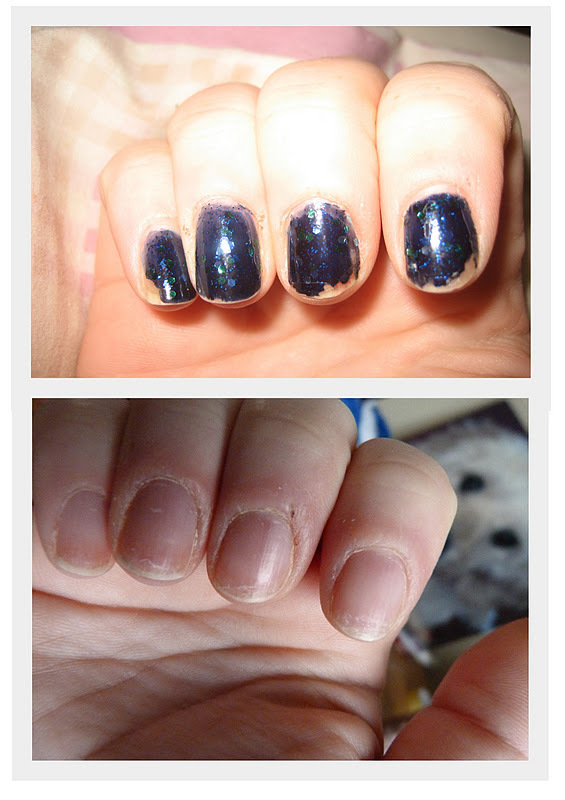 I push my cuticles back with my nails and sometimes peel off my nail polish instead of using remover to get it off. I peel hangnails back but they tug a lot and get really irritated and torn. I keep forgetting to wash my bellybutton. Also, my lips are ALWAYS dry (I literally have to have stuff on them all the time to make them seem normal) and are always peeling, and I pick off the dead skin and sometimes tear my lips until they bleed. I'm sure I have more beauty blunders, but these are what I could think of right now. Oh yeah! I don't eat properly, don't exercise enough and I smoke! Yikes! I actually gasped at the first one, cannot imagine using a 2 in 1! I always shampoo and condition every day, then a mask every few days. Your so lucky to get away with one product. I abuse my my nails too, as you've probably seen in NOTD posts. Like ribbons they are. Thank God I'm not the only offender!! - I'm so bad at taking my face off at night time. I always say I'll start this week but skip nights here and there. You've inspired me now so I'll make the effort. Lee_H - I think a lot of us ladies forget at some point or another to take our make up off at night :) I'm getting better at it but sometimes it's just such an effort!! Emma - I'm a hair-messer-wither as well, I end up tying it back every day at work because it drives me demented! I've tried to stop overplucking my brows since Bushra at The Body Shop said one was thinner than the other! I like to see that kind of post! Makes a break from all those "I'm so perfect" ones where people are patronizing (I'm not saying you do that, I just mean in general). I don't always remove makeup at night. I pick at my bruises or spots. I clean my makeup brushes when I feel like it. I use old makeup (really old). I'm a polish peeler too. And I don't even understand what buffing and cuticle oils are about! I never leave conditioner on long enough. I shave my legs for ultra special occassions only (get waxed over the summer tho so its not too bad). I really need to take care of the soles of my feet but don't. I often dry shave under my arms if I'm in a hurry in the morning and my outfit necessitates it. I've only just started body exfoliation and moisturising and still find it hard to remember/bother. Phew- feels good to get that off my chest! You should try a Lush 2 in 1 shampoo bar, it'd be better for your hair! Pantene use sulphates and all the nasty stuff. :( Love this idea, might do one myself.. inspired :P we all have bad beauty habits hehe! @Ms Bubu - glad you enjoyed the post :) I'm the same with messing with spots, so annoying! And I do have some make up that is verrrrry old :) I'm a collector, what can I say! I might take this opportunity to confess to picking any spot or scab (yes I know it's disgusting). My legs see some kind of hair removal only when I know they will be on show, the rest of the time hairs keep me warm. I only rarely wash my makeup brushes. Even if people say you should always finish your hair cleaning session by a blast of cold water there's no way I can do it. I spend ages in the shower or in the bath because it makes me feel good. I am guilty of only throwing away products that I hate from the beginning, otherwise I have eyeshadows in my bathroom that have been there for years (even one that dates from before I moved to Ireland). You should rename this post "The Confessional for ye beauty sinners"
Hi Kettle. My Name is Pot. I wash my hair twice a week if its lucky. If its not it gets stuck into a pony tail until I can deal with it. This is the reason shampoo lasts me 6 months. I hate brushing my teeth at night. It interferes with my in-bed-lindt-chocolate-ball-bed-time-treat. But I make sure to swish with water after, so I am redeemed. I also grind my teeth. I find putting cream on after a shower a total chore. so I only do the bits that itch like mad it I don't. I often forget to tone. I am a terrible picker. I fiddle with my hair, and I can't stop touching my face. Now I am off to find out what the beauty equivalent is of 10 "hail Mary's" its probably something like washing your brushes. Or hair. Thank you Karen and everyone for helping me feel normal! Up until my 30th i never really took off makeup before going to bed and sometimes, *gasp*, I put moisturiser over said makeup which was still on my face...I'm better now...only cos' I'm worried about wrinklies! Underarms could go without attention for quite a while. I'll blame the other half who doesn't like keeping stuff in the shower and regularly takes out all my stuff (read razor) which I don't realise isn't there till I want to use it! Not shufflin' across bathroom for it then! I almost never use lotion, I'm surprised I'm not as scaly as a fish by now. Also I never clean my brushes either. @Beauty on a College budget - same here, I had to lash some lotion on last night because my elbows were actuall sore with the dryness, ugh!